This Demonstration constructs a triangle given the length of its base, the difference of the base angles and a line (given by a point and slope ) that contains . This generalizes the problem given to Plemelj when he was in high school, namely, the problem in which the line is parallel to . Our construction is a simple adaptation of The Plemelj Construction of a Triangle: 4. Step 1: Draw a line segment of length and its midpoint . Draw a line . 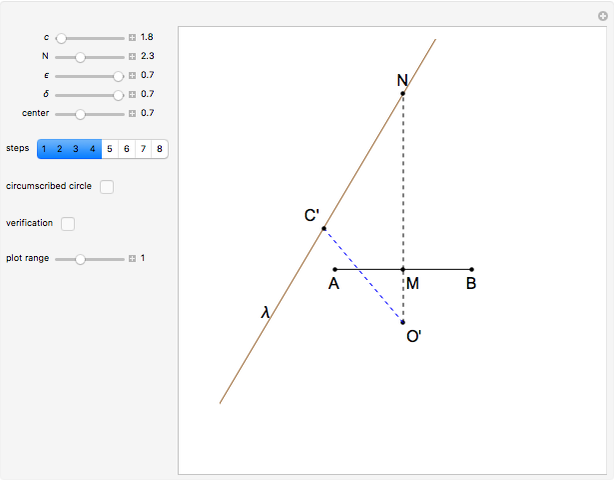 Step 2: Draw a line segment from that is perpendicular to . It meets the line at . Step 6: Let be the intersection of and the ray . Join and . 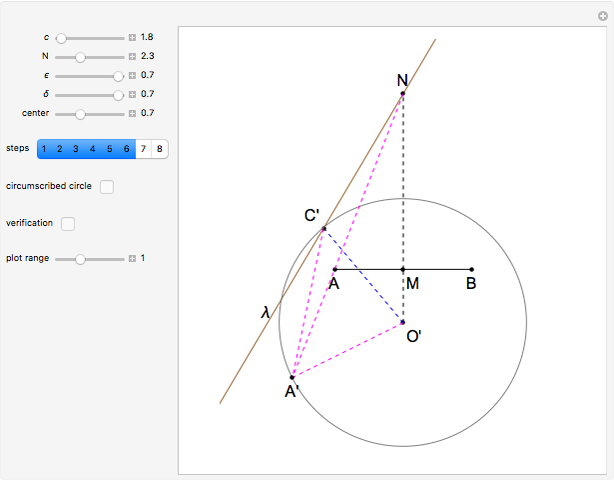 Proof: The inscribed angle subtended by the chord is , so the central angle . 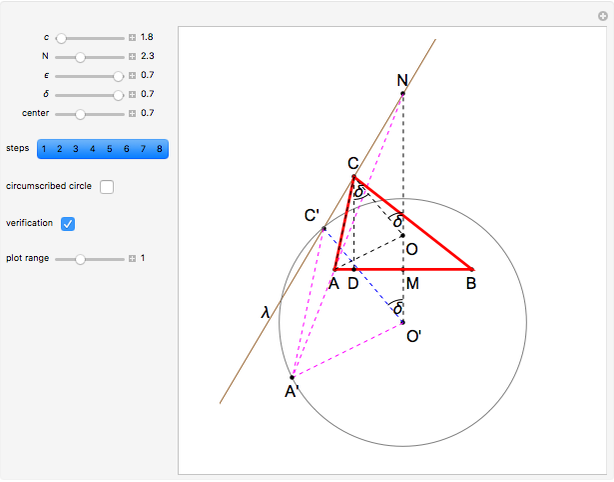 Since is isosceles, . Since , . Since , [1, Proposition 29]. So . This problem comes from , where some suggestions on how to solve it are also given. That it could be solved by Plemelj's construction was observed by Nada and Marko Razpet. For an algebraic solution, see 20. Construct a Triangle Given the Length of Its Base, the Difference of Its Base Angles and a Line Containing the Third Vertex. For the history of Plemelj's problem, references and a photograph of Plemelj's first solution, see The Plemelj Construction of a Triangle: 1. Euclid, Elements, Vol. 1, 2nd ed. (T. Heath, ed. ), New York: Dover Publications, 1956 pp. 311–312. E. Heis and T. J. Eschweiler, Lehrbuch der Geometrie zum Gebrauche an höheren Lehranstalten, Köln: Verlag der M. Dumont-Schauberg'schen Buchhandlung, 1855. Nada Razpet, Marko Razpet and Izidor Hafner "20b. Construct a Triangle Given the Length of Its Base, the Difference of Its Base Angles and a Line Containing the Third Vertex"